Studying genealogy crosses into uncharted cultural territory on occasion and it is extremely important that one understand nuances of that culture’s history in order to be effective in one’s research. Though I am a smattering of this and that culturally climbing out on my maternal branches, on my paternal line I am always climbing out of a French-Canadian limb (well with a First Nations twig or two)! I make the French-Canadian distinction based on my family’s long history in the new world. Since the 1500s and 1600s my ancestors have been clearing and plowing, portaging and trapping, trading and building, and–let’s face facts–fraternizing and procreating in the land they called New France! 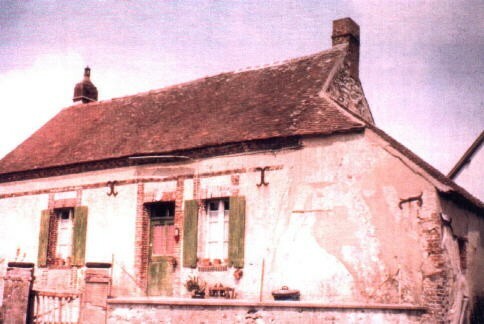 Prior to their lives here in Canada the majority of my paternal ancestors trace their origins back to Normandy, France. French-Canadian genealogy can be both challenging but also extremely rewarding. The records available to French-Canadian family historians abound thanks to the diligent record keeping of the Roman Catholic Church however if one is not familiar with the cultural anomaly of the “dit” name then all hope is lost! When I began my research I knew that the surname Loranger had at some point in history been changed from the surname Rivard. This was how it had been explained to me by family members. It wasn’t until I encountered the transition between names that I was confronted with the “dit” name and the change in name became clear. “Dit” is a form of the French verb “dire” which means “to say or tell”. In this instance it means “said” as in “said individual”. The “dit” name–as we have termed it–is in a loose sense a sort of nickname or alias. In actuality, it is more similar to the Scottish and their clan names, meant to make the distinction between various branches of a family line. Truly there are many origins to the dit names used in French Canada and the explanations are almost as varied as the names themselves. Many were originally the “nom de guerre”, a troop name grouping military members, the origins of others truly did approach the origns of nicknames–names based on an aspect of appearance, or based on the place from which the family came. In the case of the dit name Loranger it is said that perhaps it referred to a supporter of William the Orange but more likely a reference to red hair! In later years the original surname was often dropped to be replaced by the “dit” name or the “dit” name was simply dropped by others. Regardless of the origins and understanding of the “dit” name as long as one is aware of their existence there are now very helpful charts to decipher the puzzle of connecting one name to another! 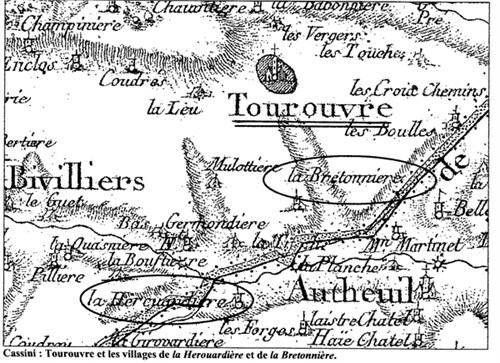 My name Loranger was the dit name of my 8th Great-Grandfather, Robert Rivard dit Loranger, the youngest son of Pierre-Nicholas Rivard and Jeanne Mullard of Tourouvre, Orne, Basse-Normandie, France. Robert Rivard dit Loranger arrived in New France/Canada in 1662 at the age of 24. He was granted land and he married Madeleine Guillet, the 14 year old daughter of a Filles-du-Roi, in 1663. Madeleine also happened to be his brother’s niece. Robert and Madeleine had 13 children. Robert had followed his older brother Nicholas Rivard dit LaVigne, already arrived in New France in 1648, and who–in a confusing web of family connections–is also my 8th Great-Grandfather. Robert and Nicholas were both landowners in New France but Robert was not one to sit still. He cleared land in half to time of others and decided to venture into the fur trade. First signing with the “Company of the North” in 1689 at the age of 50 he decided to partner with friends and relations in 1695 to create their own fur trading business known as the “Compagnie Royale”. Nicholas Rivard dit Lavigne had been a captain in the militia in Cap-de-la-Madeleine, Quebec. 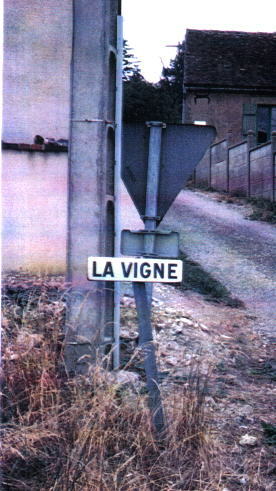 Nicholas Rivard dit Lavigne`s dit name referred to his title “Sieur de La Vigne” after his mother’s property “Clos de La Vigne” in Tourouvre, France. A road sign marks the location of this property today. Sign today marking the Tourouvre Property of Jeanne Mullard. I have to fight the urge to run off on a tangent here describing the exploits of these amazing men and their families but I am losing sight of the focus: Surnames! While several descendants of Robert Rivard dit Loranger carried on the Loranger dit name and then eventually dropped Rivard, others introduced new dit names which were adopted as surnames, and–as though things weren’t confused enough– still others kept the original Rivard surname. 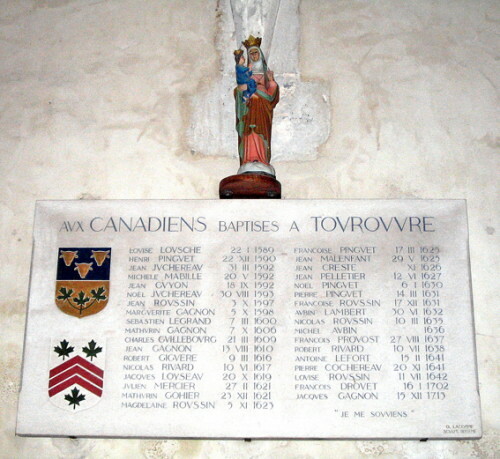 The descendants of Robert Rivard hold the names: Rivard, Loranger, Feuilleverte, Bellefeuille, Despres, Montendre, and Maisonville. The descendants of Nicholas Rivard now may hold the surnames: Rivard, Lavigne, Lacoursiere, Lanouette, Preville, LaGlanderie, Dufresne, and Giasson. If you are of French-Canadian origin and bear any of the above surnames then “Salut! Mes Cousins!” It’s a pleasure to make your acquaintance! 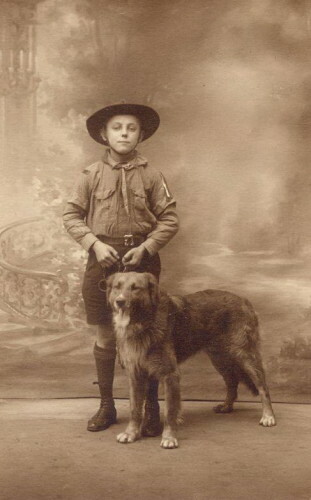 Wordless Wednesday ~ A Boy and His Dog!